Many people shy away from eating wild game because of the fear of the unknown or a bad experience with ‘gamey’ taste. As a young child I didn’t eat a large amount of wild game with the exception of the ‘mystery meat’ my parents fed me – which I later found out it was venison! However, for that last 12 years I haven’t purchased a single package of ground beef and rarely buy meat at a grocery store­. I prefer to get a package of meat from my freezer that I harvested myself. Avoiding the wild-game taste starts the moment the animal is shot. Guts should be removed as soon as possible to avoid spoiling the meat, especially in warmer climates. In colder climates, many hunters will gut their animal and hang it outside in the cold. Here in Texas we rarely experience cold temperatures and have the animal quartered and on ice within a few hours. Unfortunately, I have seen hunters driving down the road in 80-degree weather with the deer in the truck gutted but still intact. 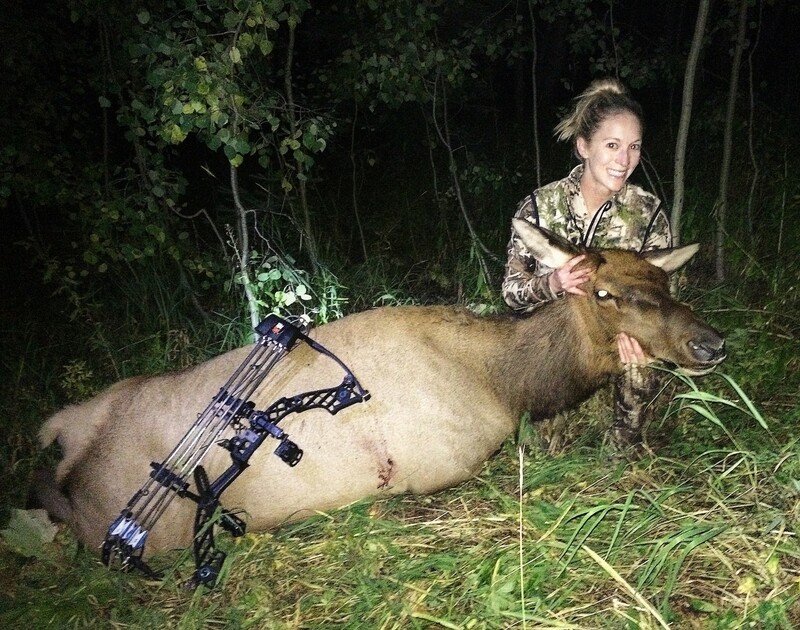 Candace with an elk she harvested in 2015. Another tip is to ‘bleed out’ your harvest. If you have the time and means to keep the meat on ice for a week while draining the blood and adding more ice, you can successfully remove a large amount of the blood in the meat and reduce the wild flavor. When cooking your wild game, you can soak the meat in a mixture of egg and milk (or buttermilk) to help with flavor. Cooking wild game is quite different than cooking beef and should not be overcooked – something I learned the hard way. I don’t usually eat my beef steaks cooked below medium but venison and other game meat shouldn’t be cooked past medium in my opinion. I don’t mind eating venison medium or medium-rare because I know everything that has happened to that meat and never worry about contamination. Cooking wild game has been trial and error in the kitchen. I love to use different spices with simple recipes for fast and easy dinners. Occasionally I will get creative and look up more complex recipes to try out. There is a vast expanse of recipes available including simple meals that anyone can prepare. My favorite is just seasoning the meat with different spices like a mesquite spice or oak-enhanced salt and pan searing it. Wild game meat has a different flavor, so embrace it and enhance it! Get creative, be fearless, and enjoy the meat you worked so hard for. Follow Camo Candace on Facebook!